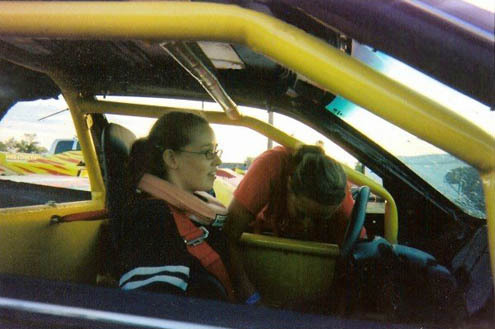 I just got pictures from Kayla, owner of the car I drove in the Faster Pastor race, of me with her car! Driving her car was so much fun! And really, she was so great to let me bang her car up. She got some awards this season, too. 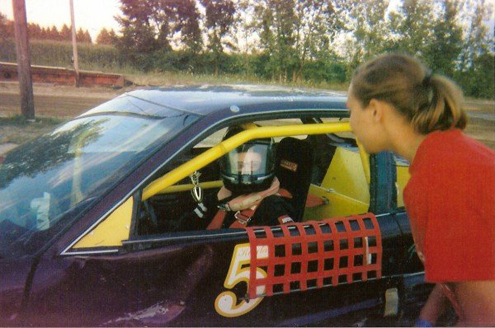 She had a 4 car dash win, a third place trophy from championship night, and the Points Championship for the Road Warrior division. 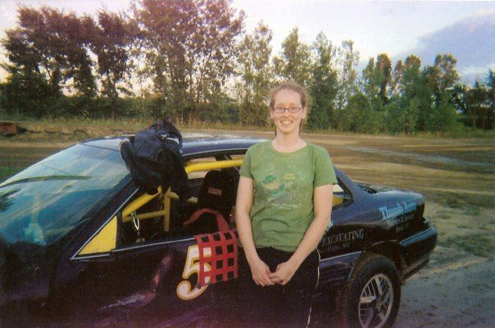 She was also most Improved Driver for Road Warriors. Go Kayla! Thanks so much to Kayla and her mom for the pictures!!! I found out that the Tuscola County Advertiser had this article in their paper on August 11th. I went and got copies today after work. It’s funny because there is just one line about the Faster Pastor race, yet I got the headline! Here is the long anticipated (hehe) picture of me with my trophy, too! The trophy’s huge! ME!!! Booyah! I won the Faster Pastor race! There was only one other pastor; Pastor Mike Beeler from Faith Gospel Tabernacle of Bad Axe. He was the winner last year when Chris raced. He was stiff competition! I think the only reason I won was because I have been adjusting my depression medicine. I have really terrible road rage. It’s completely under control usually, but I figured it could only help me in a race, so I let it out. He cut me off at one point and I said to myself, “Oh, you are NOT going to win.” That was the point at which it came out! It also helped that we had regular, front-wheel drive cars instead of the usual rear-wheel drive race cars. I didn’t have to worry about letting the car slide because it wasn’t supposed to. I guess that was the second biggest reason why I won. I wouldn’t have done as well otherwise I don’t think. Because it was just the two of us, I only won $300, instead of the $1000 they said, and he got to take the food. The money was a little disappointing. (I was hoping to get more new windows in the parsonage. We are getting three new vinyl, double hung windows already, but we really need all 13 replaced.) It is still a blessing, though. I thank God for helping me to win. And, I was glad Pastor Beeler took the food. There was a lot of it and we were afraid it wouldn’t fit in the van. Besides, their own church has a food pantry and as long as the food goes to people who need it, it doesn’t really matter. The other disappointing things were that Chris and the kids didn’t make signs for me – 😦 – and I forgot I lent my camera to my mom and she was supposed to return it, but something came up. We stopped at the only gas station we saw after we realized we didn’t have one, but they didn’t sell them. So, no pictures. 😦 No signs. 😦 At least I got a really big trophy! When I get my camera back, I’ll take a picture of it. I have to say thanks to Kayla Kreh who loaned me her car. I banged it up some. Thanks for being such a great sport. She drives a purple car (I’m afraid I’m not sure what kind) with a number 5. Thanks for letting me use your car and win! I hope you win lots of races, too! All in all, it was a great experience and I hope I get to do it again! 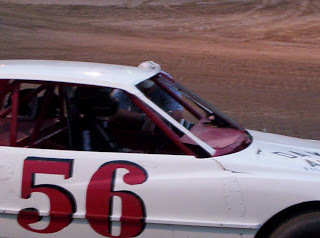 On Saturday, I get to drive a stock car in the Faster Pastor Race at Owendale Speedway. You might say I’m a little scared! Chris did it last year and didn’t want to embarrass himself again. He was afraid to go fast. I’ve been told by a man in our church, who used to race, that you HAVE to go fast to get around the corners and that you have to turn left to go right because you are letting the wheels slide! SCARY! And to make it worse, it is just a dirt track. I don’t know if that is actually a bad thing or not, but it seems scarier! The stock car owners lend their cars to the pastors and we do ten laps. We have to collect canned goods to determine poll position. Chris was in the last starting position last year, out of only four though. I will probably be last too. I don’t think that it really mattered with us all being amateurs, though. There was one paster, the winning one, that seemed to have experience last year. I wonder if I will be up against him. The winning pastor receives $1000 for their church and all the canned food collected is donated to his (or her) charity of choice. If I win, ours will be donated to the local food pantry at Trinity United Methodist Church. That picture is of Chris getting ready to race last year.